Born: May 27, 1855 in Pocasset Ma. 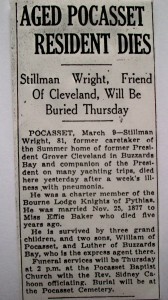 Died: March 8, 1937 in Bourne Ma. at 81 yrs, 9 mos, 9 d.
Where Lived; Gray Gables in Bourne Ma. 1. 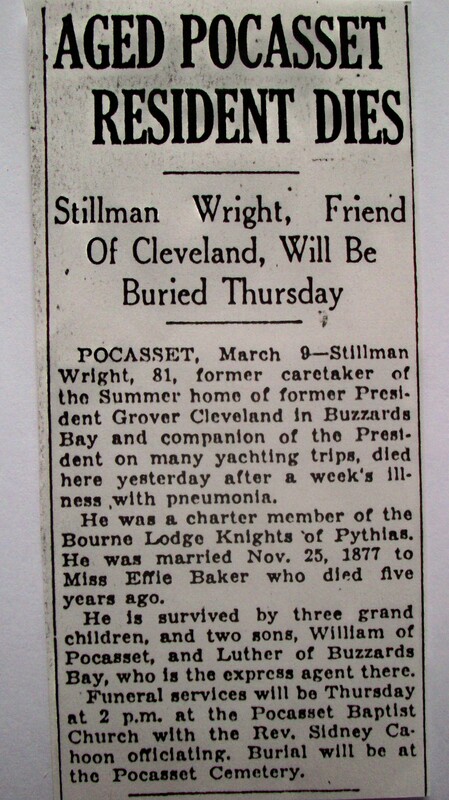 William David Wright; (May 27, 1880 – March 17, 1937); Married Edith A. Jones on September 19, 1925; Edith married (2) Ephraim T. Davis on March 6, 1940; William is buried in Pocasset Cemetery (headstone not located; interral records of E.D. Nickerson). 2. Martha S. Wright; (December 19, 1881 – ? ); No further information. 3. Luther Tilson Wright; (August 26, 1884 – October 18, 1961); Married Bessie Alan Borden (1883 – 1952) (Charles P. Borden & Etta R. Adams) in Taunton Ma. on February 27, 1906.